It’s been eleven years since Michael left town to pursue his dreams in Hollywood, leaving the love of his life, Olivia, behind. Now he’s come back to film a movie and has to face Olivia again. Olivia’s been nursing her broken heart for the eleven years Michael’s been gone, but can she love someone who hurt her so badly before? 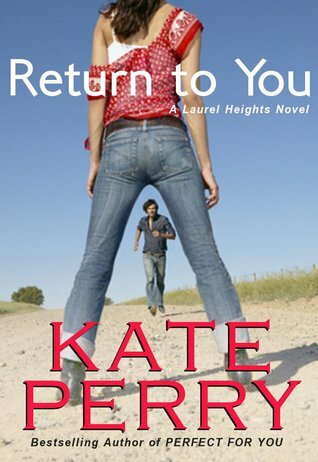 I have enjoyed each of the Laurel Heights books that I’ve read and this one is no exception. There is just so much inner turmoil and angst with Michael and Olivia. I just wanted to lock them in a room together until they got everything sorted out…oh wait, that happened (only it was a shed instead of a room) and they still managed to not get anything sorted out. Had this one been a little less angsty (I think that’s a word), I would have enjoyed it more. I did find the secondary romance between Olivia’s father and his assistant sweet and tender. If you like low conflict romances along the lines of Jill Shalvis’s Lucky Harbor series, this is a series I would highly recommend. Story Brooks is a teacher in California. She’s engaged to a doctor she doesn’t really love. Said doctor breaks up with her and right after that she learns that her father has had a heart attack in New York. She goes there to see her dad and meets Daniel Chase. Daniel is a hostage negotiator like her father. Daniel and her father have a special relationship since her dad mentored Daniel. Jack (the dad) tells Daniel to stay away from Story because he’s a man whore. He really really is. Daniel tries to honor Jack’s order, for about five minutes. I’ll be honest, the last two books put together aren’t as good as the first one. This book was okay but it didn’t make me flush or blush. I love a dirty talking man and Daniel didn’t talk dirty very much. There are a few things I’ve come to expect from Tessa Bailey and a filthy mouthed hero is one of them. Don’t get me wrong, I will still read Tessa Bailey! I just wish the last two books were as good as the first.